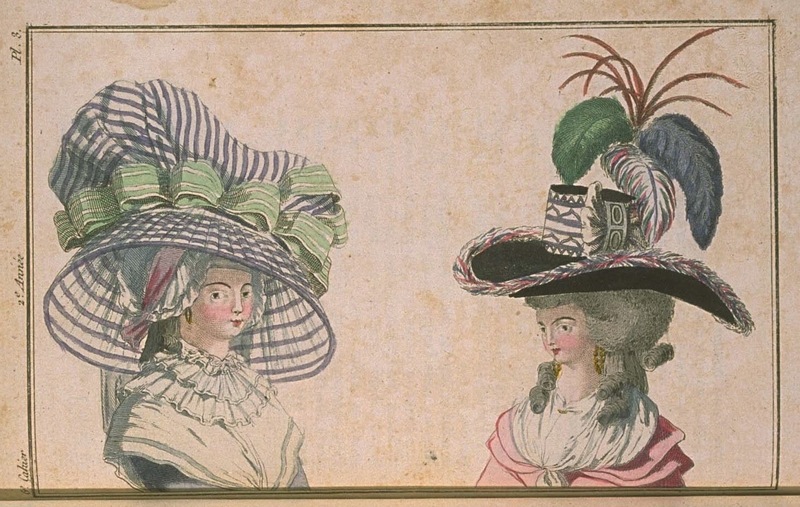 We said in the second Book of this second Year that women hardly go out in the morning but in night caps, when they aren't dressed; we should add here that many wear a chapeau-bonnette over the night cap. In this manner, they give an air of half-dress which saves them from the great undress that the simple night caps, which would never be supportable without fashion, present to the eye. How was this fashion begun? We dig into our heads to imagine it, and do not succeed. It is impossible for us to conceive it, when we think that there are so few women who have a seductive air in a night cap. Everything that we can find is that women have decided to renounce looking pleasant during this part of the day. Could we concede this beautiful invention without fear that we will be reproached for pronouncing some blasphemy against the Ladies' taste? The Woman dressed in a violet satin gown wears over the night cap a gauze chapeau-bonnette, with violet and white stripes, belted with a wide apple green ribbon with white stripes, forming a large bow on the left side. She wears a kerchief with three rows of ruffles, fastened in the front with a gold pin; gold earrings à la Plaquette. Her hair is rolled under her cap, and two large curls which fall on her chest are allowed to escape from either side; in the back, it is pulled up in a flat chignon. The Woman dressed in a chemise gown of wadded Indian taffeta wears a black felt hat, edged with a white feather with disconnected pink points, belted to the top of the crown with wide ribbons with white stripes and violet designs. These ribbons pass through a long and wide steel buckle, and for a large bow on the right side. From under this bow rise three large green, violet, and green and pink feathers, and an aigrette of flame-colored rooster feathers. On her neck, a full kerchief, fastened with a gold pin, with a large crescent head. In her ears are gold earrings à la Plaquette. Her hair is all frizzed en tapet, from which three large curls detach on each side, two of which fall on her chest. Behind, her hair is pulled up in a flat chignon. M. DONNET, Merchant Hatmaker, rue St. Honoré, near rue de l'Echelle, continues to sell a very great quantity of felt Hats of diverse colors.The most fashionable are those in canary's tail, Sky blue, black, apple green. Merci pour cet article excellent ! J'ai lu le même genre de nouvelles ici https://nexter.org/fr/ et j'ai également trouvé beaucoup de faits intéressants.